When I told people I was going to explore behind-the-scenes at my local RSPCA unit I got a giggled response of "How many did you take home? ", and the answer is Bronwyn. I took Bronwyn home. I don't know much about her, but I believe she's about 5, and I think her family gave her up when they moved house. She has been suffering from blood in her urine, which wasn't clearing up with medication. They believed it may be due to stress at being in the cat pod. I'm now her official foster carer (using the word parent seems silly....but so does carer....maybe I'll stick with fosterer). Oh, and she is officially called Tabby, but that just seemed too basic, so I renamed her Bronwyn. The RSPCA have 3 types of fostering needs; animals ready to be rehomed, animals involved in legal proceedings, and animals being cared for under the PetRetreat scheme, which helps families fleeing from domestic abuse. I'm fostering for the RSPCA Central, West & North East London branch, and they offer more details on their page if you're intrigued. Fostering is divided into short-term and long-term fostering dependent on the needs of the cat. Short-term arrangements may involve cats who need some medication, socialisation or TLC. Or they may just need housing due to the heavy demand on cat rescue centres. A glowing reference from a fosterer may be all a timid cat needs to find their forever (furever) home! Long-term placements are usually older cats, and may have medical needs that would make them unlikey to find a permanent adoptive home. If you foster a cat like this, all vet bills are taken care of by the branch, and the branch retain all decision making responsibilities for the cat. 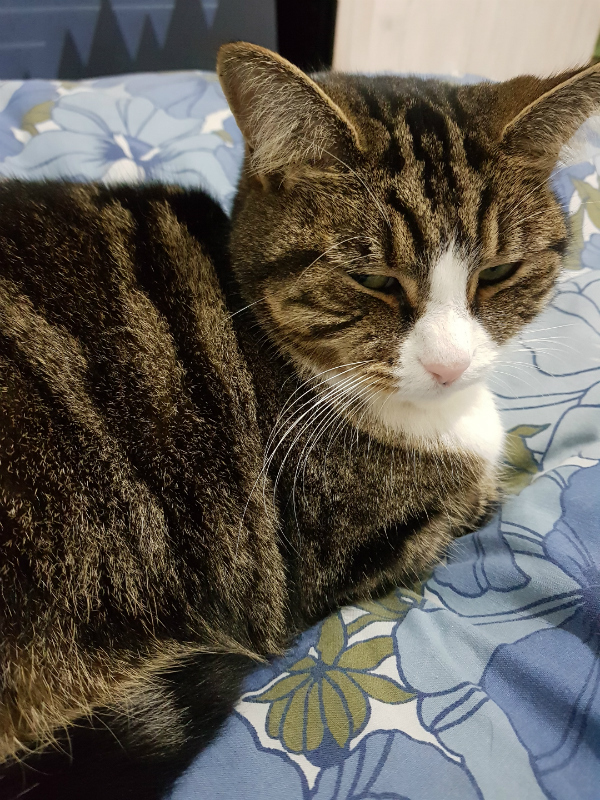 You can offer a wonderful little retirement home for an eldery moggy, without the need to worry about the mounting vet bills. Ideal if you want a slower, less energetic cat. 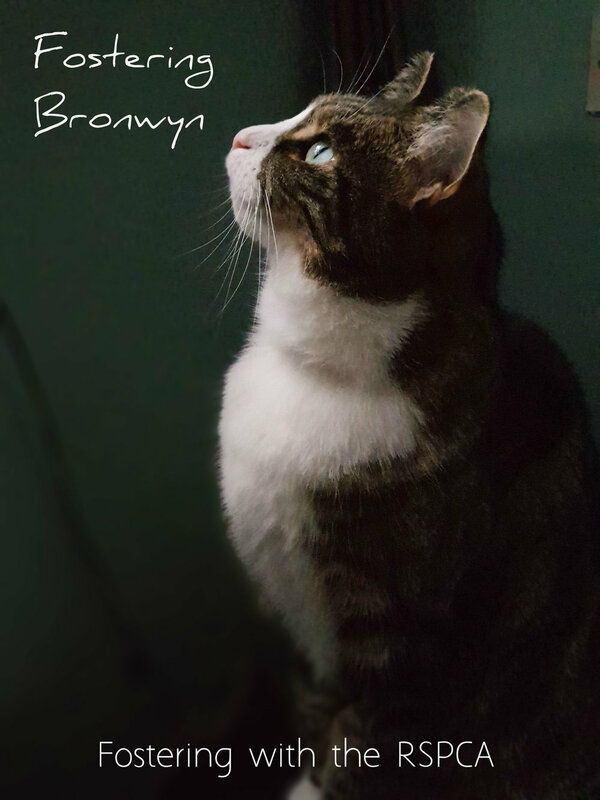 Today is the 3rd day Bronwyn has been with me, so I thought I'd share some of my personal experience of becoming a cat fosterer. I brought her home, and has prepared myself for an anxious start. Cats in new surrondings often hide for a while, under a sofa or bed. Bronwyn spent about 30 minutes walking around the flat, but didn't seem too stressed out at all. The first night she came onto my bed for a bit, and even under the blanket for a short while. When I woke up her little purring face I knew we'd get along just fine! Every time I get up to check on her, she's just fast asleep, curled up on my bed. She enjoys watching the window, a little head rub, and dinner time. She's settled in so quickly, and I'm already falling in love. She now sleeps by my feet all night. She's already a joy, and although I want her to have her forever home...I'm sort of hoping she'll be with me for a while. She was clearly loved by a family at some point, and I'm feel honoured to have her, for however long I do. She's got a urine test in a few days, after we finish her medication cycle, so I hope we pass it with flying colours. Wish her luck!